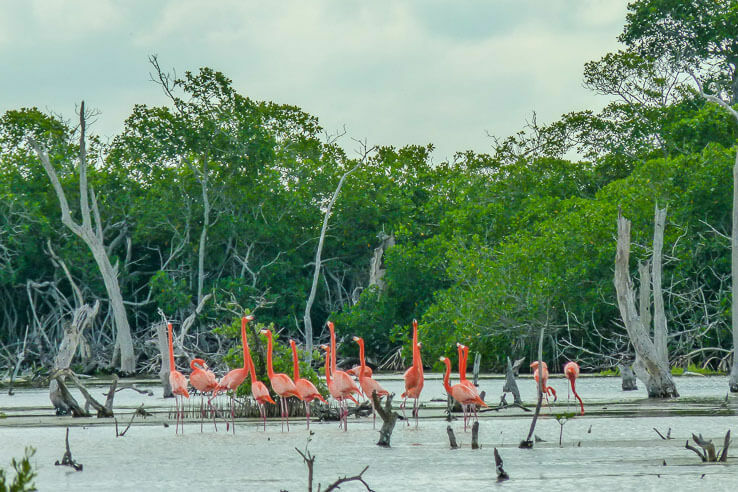 Day trips from Valladolid can take you to several Mayan ruins and cenotes (natural sinkholes), the Carribean beach town of Tulum, or Rio Lagartos on the Gulf of Mexico to see crocodiles and flamingos. Colonial gem in the middle of Yucatan is an ideal place from which you can explore Yucatan peninsula. Valladolid is slowly becoming popular but still keeping its charm. Town itself has plenty of sites and activities you can try. 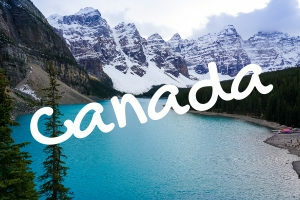 If you plan few day trips around, there is a huge selection of trips for everyone. Valladolid has a bus station near the main square which connects with all the surrounding towns and sites. Company ADO is providing first class service, Oriente offers second class. More reliable than second class buses are colectivos (shared ride vans). It will depart when the van is full, you pay a fee to the driver and he will drop you off wherever you like. Parking lot with colectivos is right behind the corner of the bus station. 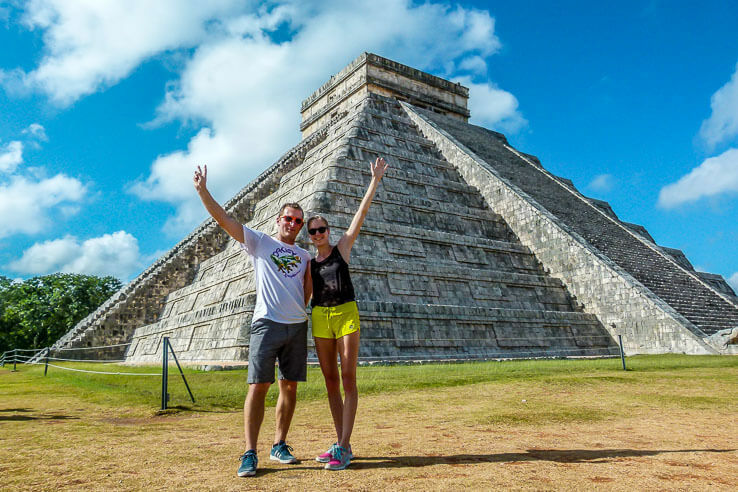 It is a very popular and convenient way to travel around and our favourite; it’s easier to interact with locals – once we’ve met a tour guide who told us about local people and life in the Yucatan. Would you like to stay in Valladolid? 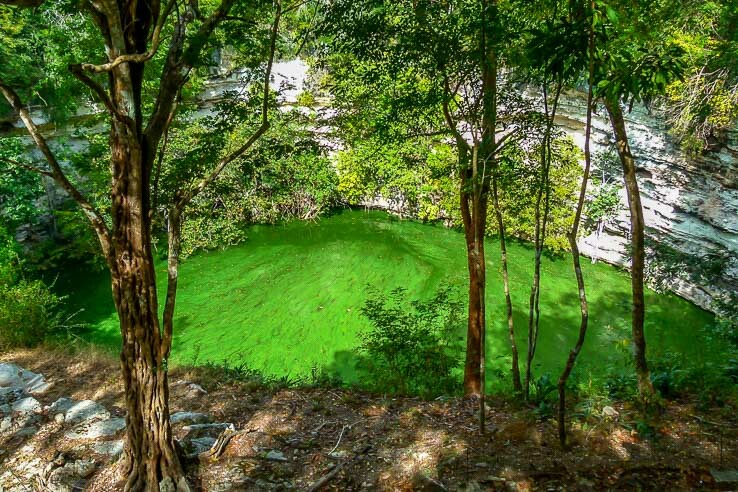 This is a complex of two cenotes – Samula & X’keken. They are located south of the city and accesible by bike or colectivos (1$ per person). You can visit one or both (3$ for 1, or 5$ for both). As we were short on time, we’ve visited cenote X’keken. It took us around 20 minutes by bike from the centre of Valladolid. After few steep stairs down, you find yourself in a huge limestone cave with stalactites hanging from the ceiling and only one hole which is illuminating the pool. Water is constantly at 25C all year round, very nice for swimming or snorkeling. Tip: Visit before noon to avoid tour buses. Archeological site Ek Balam in only a short ride from Valladolid. These are the newest ruins in terms of excavations. Archeologists are working hard on site to uncover all the ruins around. They have been just recently opened for visitors. It is a very unique place with intimate atmosphere and small amount of visitors. We were allowed to climb the tallest ruin Acropolis – steep 106 steps. It gave us a bird’s-eye view of the surrounding jungle. 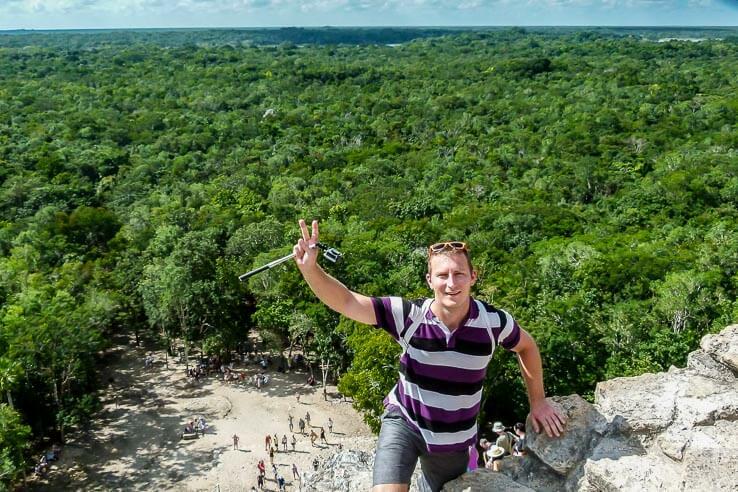 On a clear day, you can see all the way to Coba, 50 km away. 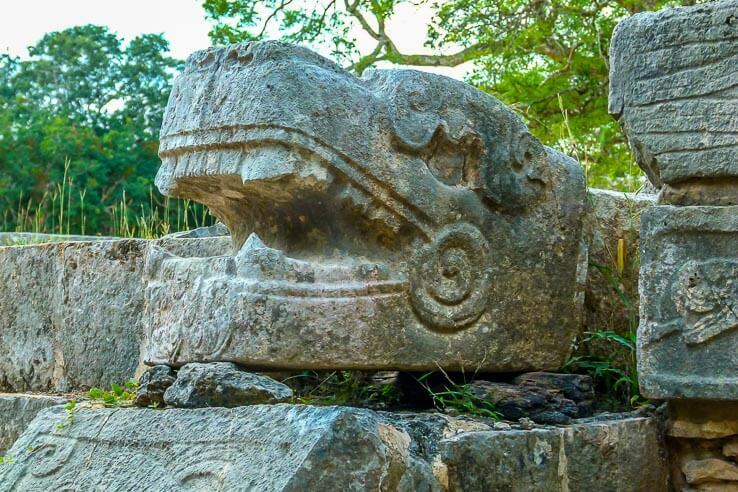 Under the thatched roof, we admired Mayan carvings and jaguar’s mouth (see picture below). Large teeth of the jaguar create an impression of the jaguar’s mouth protecting the tomb. Ek Balam in Mayan means dark jaguar. Therefore most of the carvings symbolize jaguar. They are all very well preserved and reconstructed. 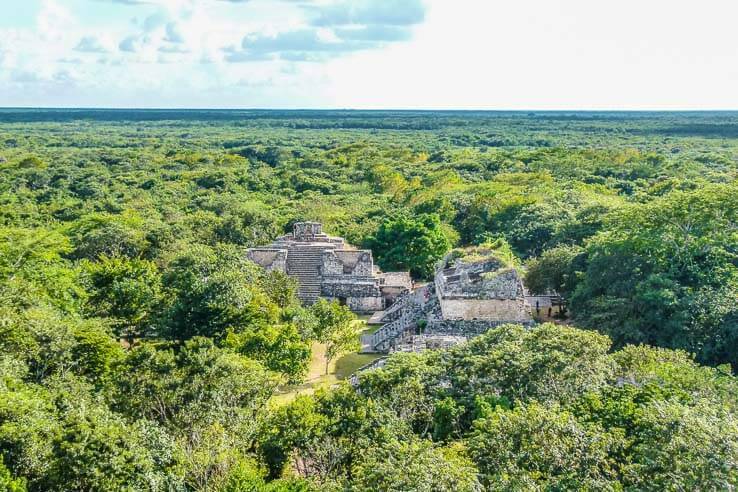 Tip: If you have time to only see one ruins, I’d recommend going to Ek Balam. One of the Seven Wonders of the World. The best known pyramid “El Castillo“ (the castle) became one of the new seven wonders of the world in 2007. It is 24 meteres high and climbing or touching is not allowed. Chichen Itza and the Cenote of Sacrifices are still sacred landmarks for Mayan people. The whole area accesible for visitors covers 5 square kilometres. It took us hours to get around all the ruins in the area. Since we haven’t paid for a guide, we were using our guidebook to learn more about the different buildings. Left impressed by the ruins, we went to refresh to the nearby cenote. Given its location and importance in Mayan culture, Chichen Itza is one of the most visited archaeological sites in Mexico. 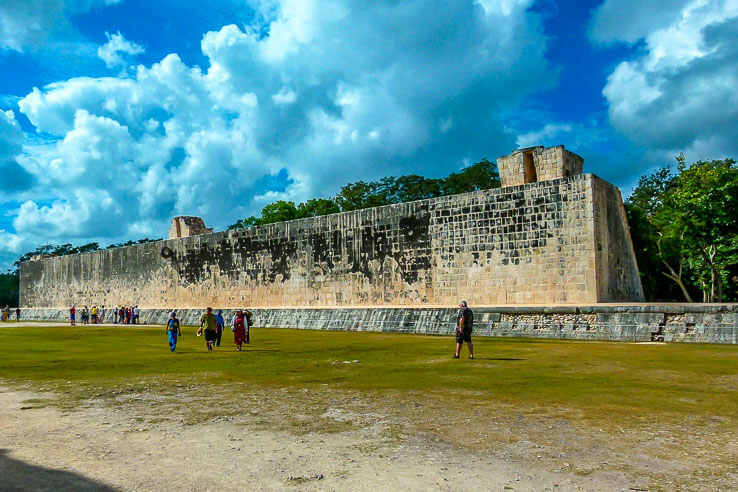 Big part of Chichen Itza were ballcourts. The one below is the biggest – the Great Ball Court. Mayan people used it to play a game similar to today’s football. Tip: Cheapest option to get there are Oriente buses (around 2$ one way), colectivos are faster but a bit more expensive (around 8$). Make sure you arrive the second they open the gate, otherwise you will be dealing with long lines and very crowded place. 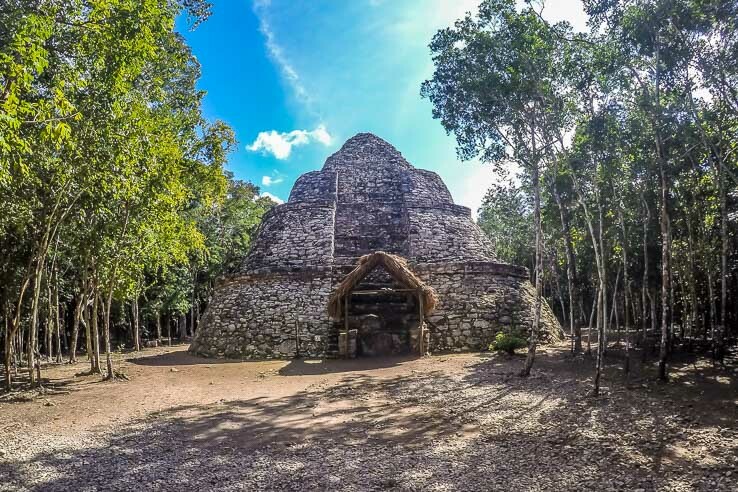 Coba was a very important town on Yucatan peninsula in the Mayan civilization. With estimated 50,000 inhabitants, it was a trading crossroads very close to the sea. 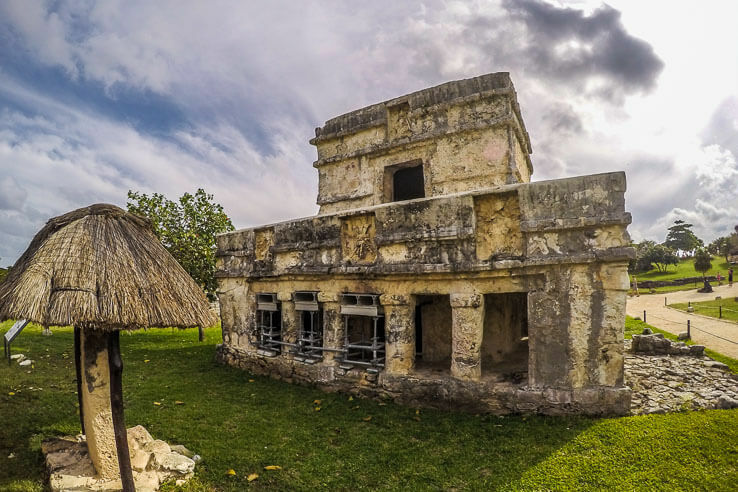 Coba is located between Tulum and Valladolid, making both of these cities a good base when visiting. We took an Oriente bus from Valladolid in the early morning. 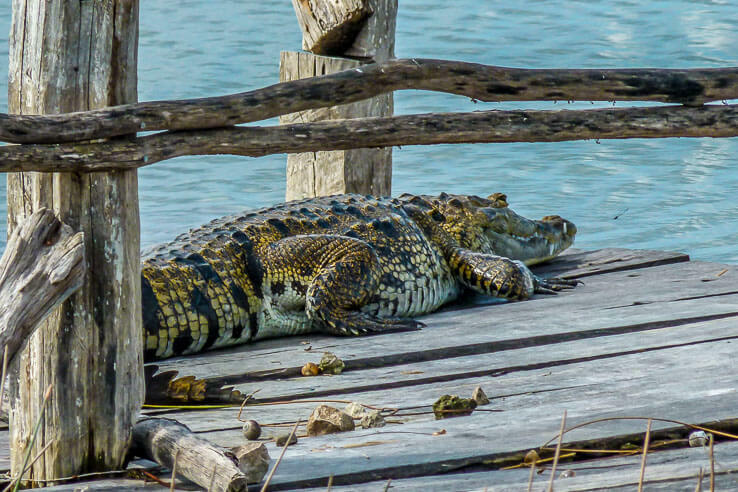 After a morning walk along the lagoon, we were greated by a little crocodile sun bathing at the end of the pier. Buildings were built around two lagoons. You can rent a bike to get around ruins more easily. As we biked around the jungle, shade made by surrounding trees were a welcomed change. Because the closest possibility to take a dip was a lagoon occupied by our new crocodile friend. 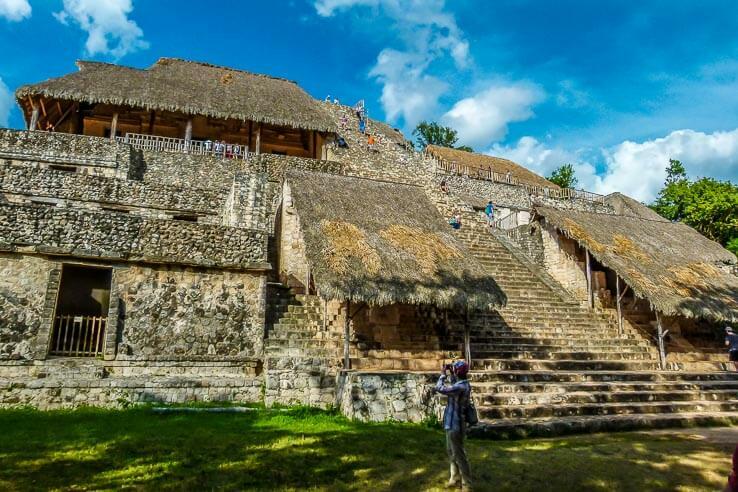 The site has numerous large temple pyramids, the tallest being Nohoch Mul. You can reach the top by climbing 130 steep steps. Tip: Find out a schedule for the bus in advance. We couldn’t find a bus schedule or colectivos near the site – most people visiting were from tour buses. Everyone we’ve asked told us a different arrival time, so we bought a fresh coconut from the stand to raise the mood and took a taxi back to Valladolid. 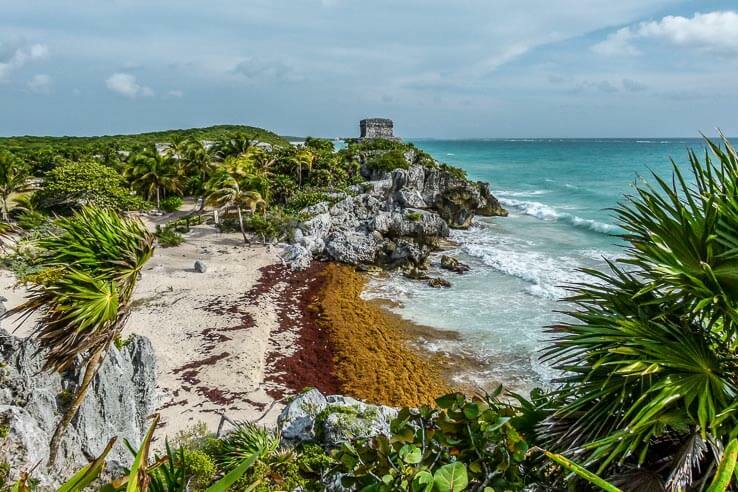 Tulum is a small town on Yucatan’s Caribbean coast. 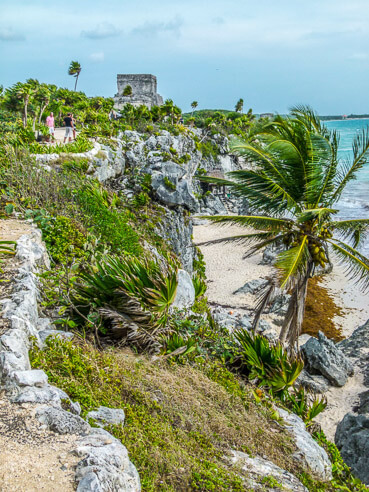 The archeological site at Tulum National Park overlooks the sea. Castillo, built as a watchtower, is located on 12 meter tall cliff. The beach underneath is accessible for swimming in certain parts of the year. Since we’ve visited after a major storm, the beach was too dirty for swimming. Tip: Arrive as soon as possible – groups of people with tour guides are very often blocking the way when walking around the site. 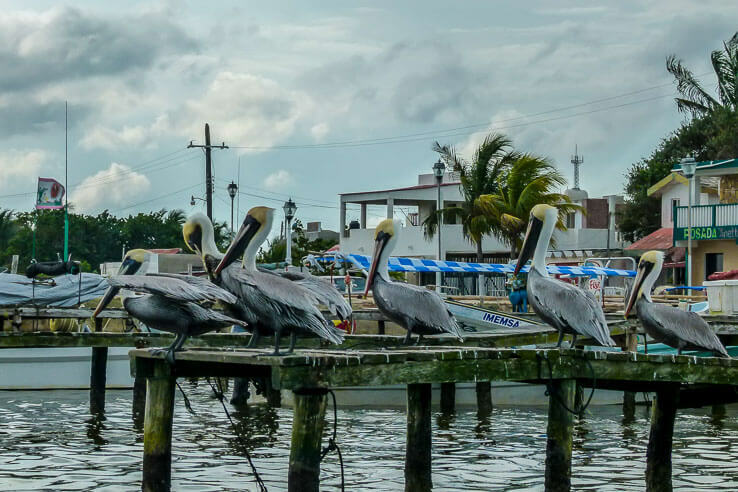 Small town of Rio Lagartos lies on the north coast of the Yucatan. 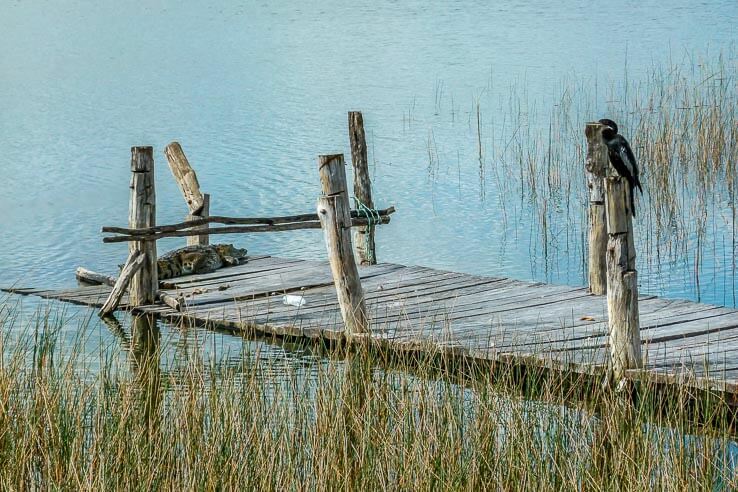 It‘s located by the lagoon Ria Lagartos, part of a natural reserve and an ideal place for birdwatching. Almost 400 species live in the lagoon. Most people go to Rio Lagartos to see flamingos. They live there all year long. 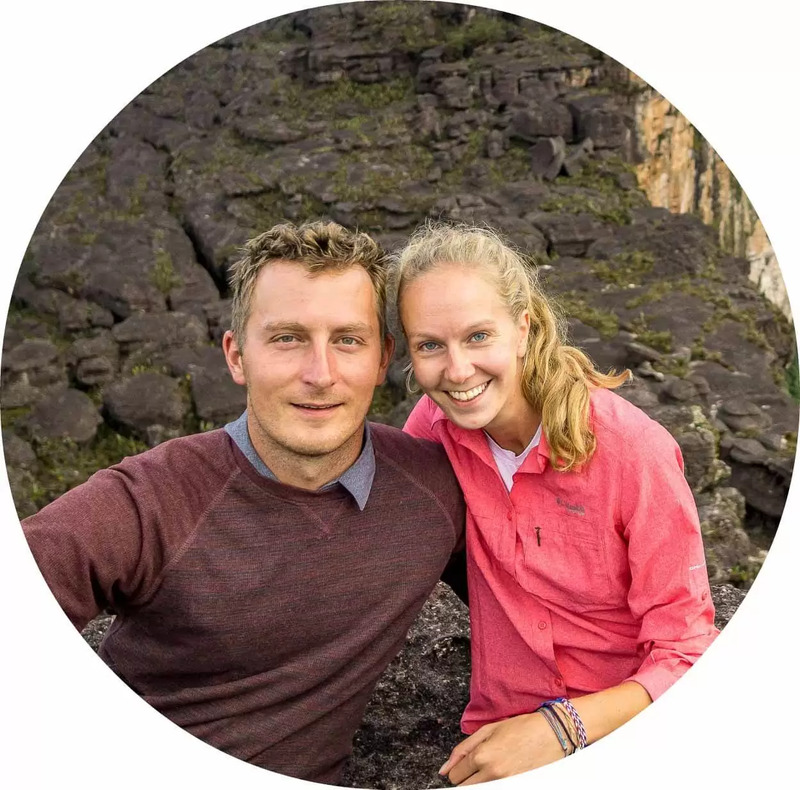 Tip: I recommend booking a tour with Mexigo Tours and ask for John – the most knowledgable guide we’ve ever met. Which of these day trips from Valladolid would you consider? 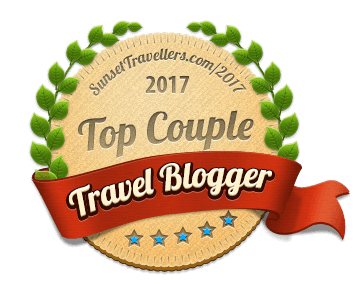 Learn about Mayan culture, swim in the cenotes or watch flamingos? Share it with your friends or PIN it to your Pinterest board. 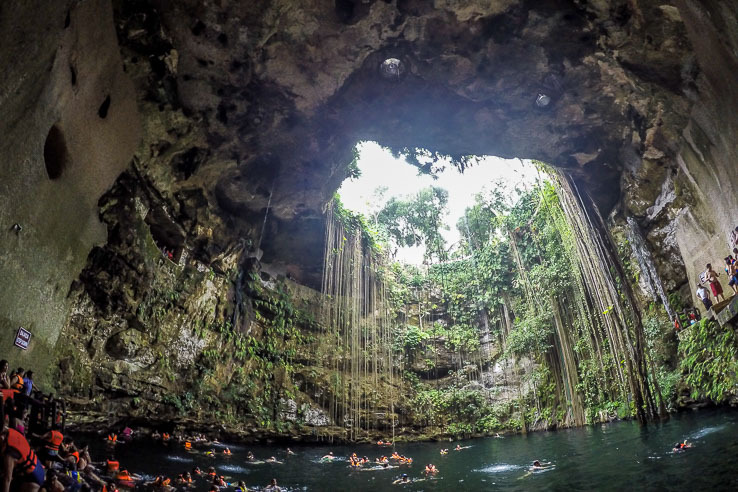 I discovered what a cenote was when I was in Mexico! Haha these are all really great recommendations. 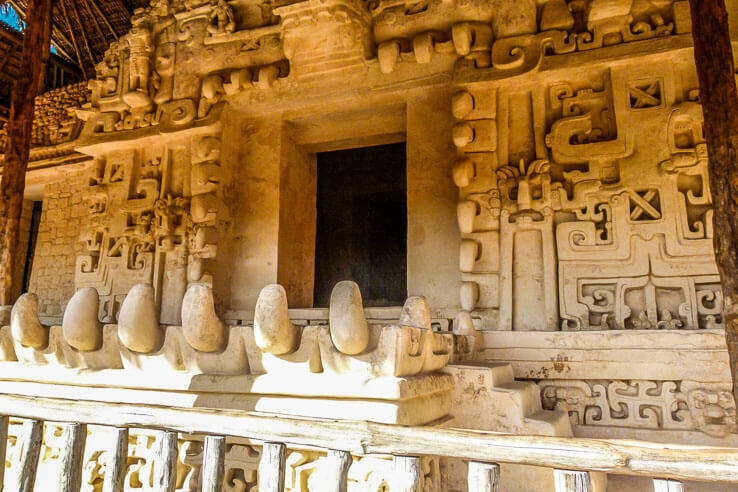 I would like to visit all of them when I go to Mexico again – Ek Balam, Yucatan for sure! 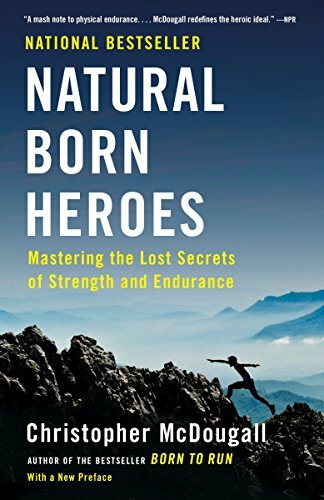 Great recommendations! Your photos are gorgeous and giving me a case of wanderlust. All these day trips look amazing. Hi Maya, amazing photography, I see here! 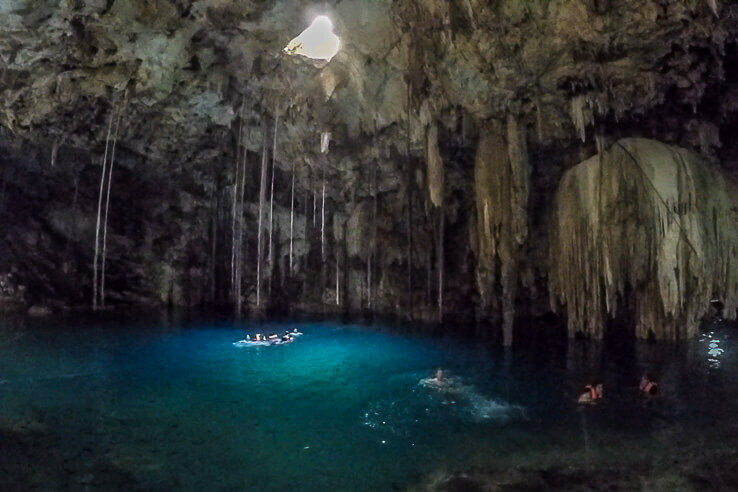 I was very interest in the cenotes, since I skipped them when I was in Yucatan. Big mistake! Now I really feel like returning there and including the cenotes and Valladolid itself. How did I miss this wonderful comment I’ll never know. 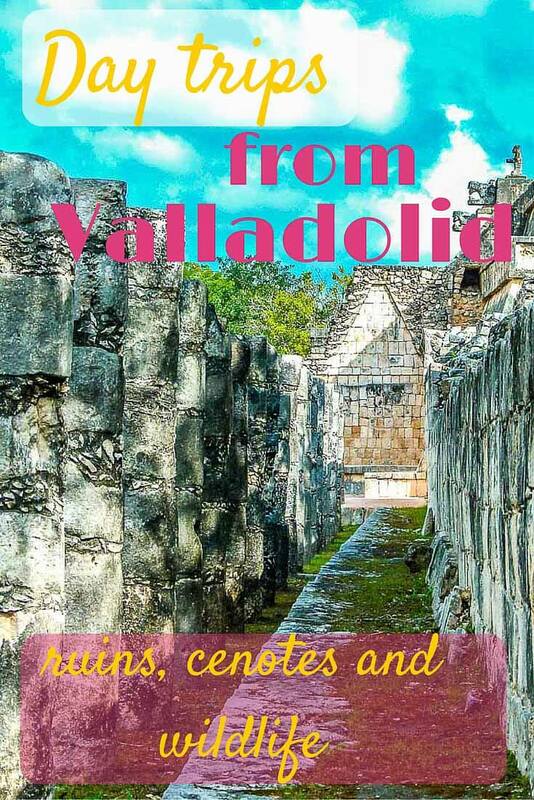 I’m glad you liked the post and would like to visit Valladolid and cenotes. It felt like authentic Mexican town, I’d recommend visit to anyone!